The Finnish word Terassikiila consists of two words, 'terassi' and 'kiila'. The word 'terassi" means terrace, patio, restaurant garden, beer garden, etc. The word 'kiila' means wedge. 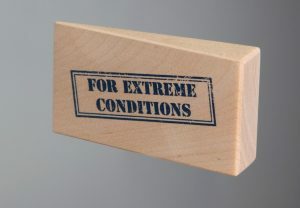 Terassikiila (or Terrace Wedge) is a nickname for our wooden product, which is used to stabilise a rocking table or chair by putting the wedge under the foot of a table. 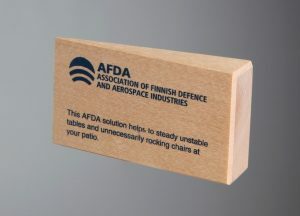 Terassikiila is manufactured in Finland from Finnish wood (birch). Terassikiila can be provided with a (key ring) hook in order to attach it to a bunch of keys. Attached to the keys the 'Terassikiila' will always be there when you need it. 2017 Finland is celebrating its 100 years of independency. Also Terassikiila takes part in these celebrations. 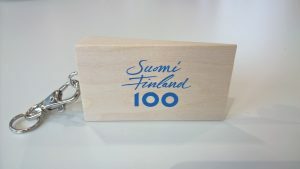 We have made a brand-new Finland-100 -Terassikiila with instructions in English. If you are visiting Finland, you can buy your own Terassikiila from a dealer (sorry, the page is in Finnish 🙁 ). If you are interested, please conctact us at info (at) terassikiila dot fi. 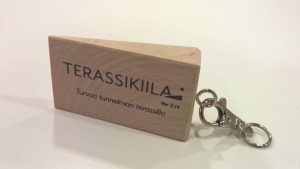 When ordered bigger amounts (for companies), the other side of the Terassikiila is provided with the company logo, slogan, etc and the other side contains instructions for use. You can also order smaller amount for private use with your own greetings.